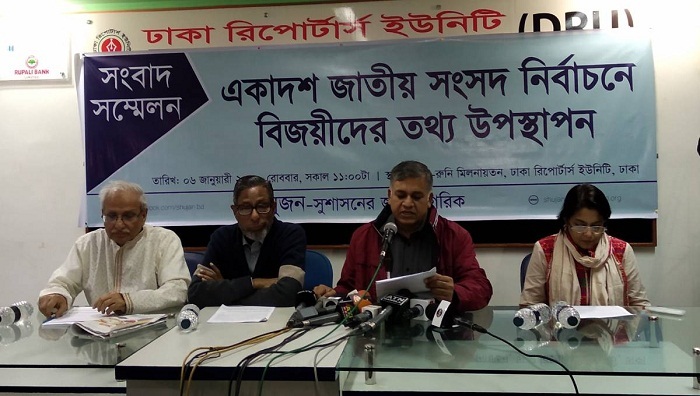 Sushasoner Jonno Nagorik (Sujan) has urged the Election Commission (EC) to properly investigate the irregularities took place during the 11thnational election held on December 30. “Many candidates did not submit proper documents along with their respective nomination form. The commission should investigate the issue seriously,” said Secretary Badiul Alam Majumdar at a press conference at Sagar-Runi auditorium of DRU on Sunday. Besides, huge irregularities were reported on the voting day and the EC needs to investigate those, he added. Convener of the organisation Dilip Kumar Sarkar read out a written statement and presented a multimedia data story prepared on the 11th national election. He mentioned that businessmen were given priority by all the political parties to contest the election and around 61.07 percent of them came out successful in the race. “Businessmen’s participation in the parliament is being increased day by day,” he mentioned. “At least 17 people were killed and more than 200 injured as well as vote rigging, attack on candidates by the supporters of rivals, mass arrest and countless incidence of violence took place during the 11th national election,” he claimed.